Dr Jacqueline Walker joined the School of Human Movement and Nutrition Sciences in November 2015 and is working as a Research Fellow. She completed her doctoral degree in paediatric nutrition at The University of Queensland in March 2013, focusing on energy balance and body composition in children with cerebral palsy. Prior to this, she completed her undergraduate studies in exercise science and nutrition and dietetics at The University of Sydney. Jacqueline has worked as a dietitian for a number of years in acute hospital settings, community clinical settings and private practice, specialising in paediatric dietetics. 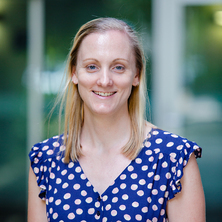 She is an Accredited Practising Dietitian and Accredited Sports Dietitian, and a member of both the Dietitians Association of Australia and Sports Dietitians Australia. Walker, Jacqueline Louise (2012). Energy balance and body composition in young children with cerebral palsy PhD Thesis, School of Medicine, The University of Queensland.